Two new Apple job postings suggest new development paths for Siri, Apple’s virtual digital assistant. Siri’s UI could be getting a makeover, and Apple could be working on an API to foster greater third-party integration. Apple blog 9to5Mac discovered the new job postings. One is for an iOS Software Engineer, while the other for a Senior iOS Software Engineer. Both positions are with the Siri team and specifically mention that new hires would be working with Siri’s UI, particularly the conversation view, which logs a user’s back-and-forth interactions with the voice-activated assistant. Currently, the only third-party support Siri’s API would need to address would be for Yelp and Wolfram Alpha. Every other service Siri performs seems to integrate with Apple’s own products, like Mail and Reminders. The job posting therefore suggests it’s possible Apple could be branching out to include other apps or services. Candidates? Perhaps OpenTable, which the old app version of Siri used to address for making restaurant reservations. Because Siri is officially an Apple beta product, we knew we’d be seeing additional features and partnerships as the technology matures, so it’s not a big stretch to assume these new positions will be helping Siri expand her purview. The new Apple positions also require “passion for the Macintosh platform” and stipulate a familiarity with Unix and Mac OS X. Our translation: If you’re going to work at Apple, you better love and know your way around a Mac. But if you want to interpret the job postings with a bit more imagination, you might surmise that Siri’s on its way to the Mac platform. While pondering the future of Siri is all fun speculation, tangible Siri development continues in the hacking space. In fact, Siri is becoming almost as popular a hacking platform as Microsoft’s Kinect was when it first launched. Some notable endeavors thus far include Siri being hacked to control a thermostat, as well as to start and unlock a car. And remember how we thought Apple’s future TV would include Siri voice control? A developer named Todd Treece apparently didn’t want to wait any longer, so he hacked Siri to act as a universal remote himself. He can tell Siri to change the channel to, say, CNN or The History Channel, as well as turn the TV on or off. It appears that Treece decided to give Siri a bit of snark — in the video below, she’s mildly NSFW due to some language. 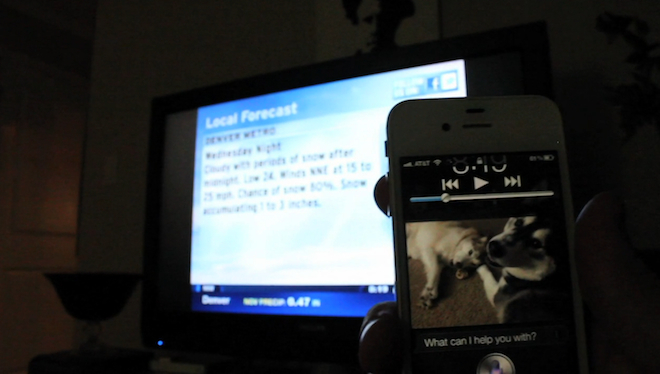 He used an Arduino and the same SiriProxy that was used in the thermostat hack to accomplish his Siri-TV integration.